There are hundreds of dog breeds, not even including crossbreeds or hybrids. The exact number varies depending on which international kennel club or breed registration group you ask. With so many breeds to choose from, deciding on your next pet dog can be quite a challenge. But one question inevitably comes up –after, of course, deciding if the dog in question is cute and cuddly – that is, whether the dog is smart. That’s a perfectly sensible question. I mean, who would want to have a stupid or dumb animal for a pet? Enter the Goldendoodle. A cross between a Golden Retriever and a Poodle, it is a new-comer, developed only in the 1990s. A quick search will reveal that the Goldendoodle’s parents are considered two of the smartest dog breeds. That is by design. The idea, after all, was to create a friendly, intelligent, and easy-to-train guide dog with a minimal shedding coat and little dander. 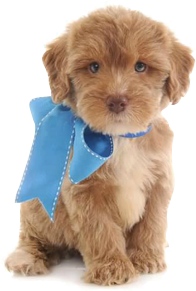 Owing to this great combination, Goldendoodles are able to carry out different roles. They serve as guide dogs, therapy dogs, search dogs, sniffer dogs, and rescue dogs in different parts of the world.